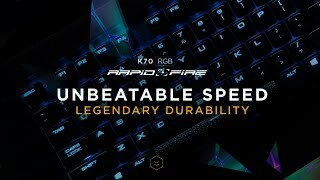 K70 RAPIDFIRE has 100% Cherry MX Speed switches for the world’s fastest mechanical keyboard performance. 100% anti-ghosting with full key rollover on USB ensures every keystroke translates directly into accurate gameplay. It’s backed by a lightweight aluminium chassis and dynamic, vibrant LED backlighting. CUE enables sophisticated macros and dramatic effects and animations. The USB pass-through port is positioned for uninterrupted game play and ready for your mouse or wireless headset adapter. A detachable wrist rest and dedicated multimedia controls with a metal volume roller keep you playing for hours, and contoured, textured FPS and MOBA key sets keep you in control. Weight: 1.20 kg / 2.65 lbs. More links for "Gaming K70 RAPIDFIRE Mechanical Keyboard, Backlit Red LED, Cherry MX Speed UK (CH-9101024-UK"